Explanation: This remarkably complete view of Earth at night is a composite of cloud-free, nighttime images. The images were collected during April and October 2012 by the Suomi-NPP satellite from polar orbit about 824 kilometers (512 miles) above the surface using its Visible Infrared Imaging Radiometer Suite (VIIRS). VIIRS offers greatly improved resolution and sensitivity compared to past global nightlight detecting instrumentation on DMSP satellites. It also has advantages compared to cameras on the International Space Station. While the space station passes over the same point on Earth every two or three days, Suomi-NPP passes over the same point twice a day at about 1:30am and 1:30pm local time. Easy to recognize here, city lights identify major population centers, tracking the effects of human activity and influence across the globe. 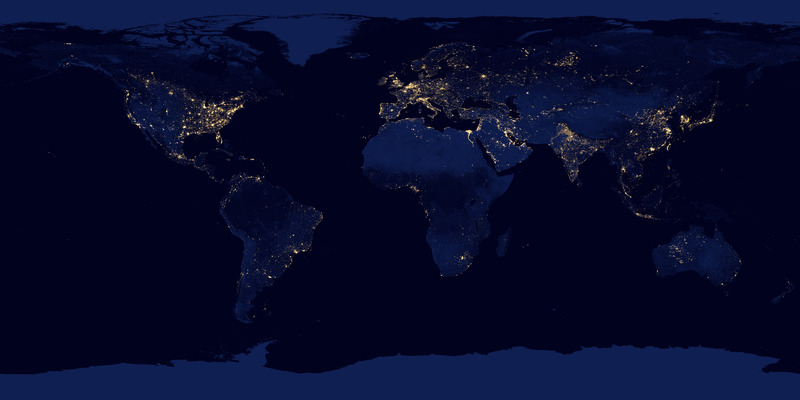 That makes nighttime images of our fair planet among the most interesting and important views from space.